Bell Helicopter's V-280 Valor tilt-rotor aircraft was flown by a U.S. Army pilot for the first time on Feb. 7, 2018. WASHINGTON — The Army’s plans to develop a future vertical-lift aircraft appear to be slow-rolled, fiscal 2019 budget documents show, despite the service’s rhetoric that it wants to expedite the procurement of a new helicopter. Future Vertical Lift (FVL) is now among the Army’s top six modernization priorities and a big push to ensure it comes online is afoot as the service forms its new Futures Command that will oversee these priorities. A special “cross-functional team” (CFT) has been formed specifically to address the future of vertical lift for the Army. But FY19 Army budget request justification documents, when compared to FY18 documents, show the process to ultimately procure an FVL aircraft is significantly delayed, particularly in the technology development phase of the program. Despite FVL receiving $95 million in FY19 Research, Development, Test and Evaluation funding, the schedule “may be slipping” and “should trigger meaningful Army contractor [capital expenditure] and [internal research and development] investment,” defense analyst Jim McAleese, of McAleese & Associates, observed in a recent analysis on the Army’s budget request released earlier this month. According to the budget documents, the start of technology development phase of the FVL program has been pushed back by just over two years. The Army wanted to reach that milestone in the second quarter of FY19, according to the FY18 budget documents, but the service is now planning to hit that mark in the third quarter of FY21. Subsequently, the release of the request for proposals for design concepts for an FVL aircraft is also pushed back for roughly two years. The Army is now expected to drop that document in the fourth quarter of FY21. The Army also won’t reach a contract award for a technology maturation and risk reduction period until the first quarter of 2023. While the service, in the FY18 documents, charted the TMRR phase to last from the second quarter of 2021 through the first quarter of 2024, the FY19 budget books don’t show how long the TMRR phase might last, so it’s unclear if there’s room to make up for lost time there. The Army’s analysis of alternatives — which began in the third quarter of FY17 — is scheduled to take a longer period of time to complete, according to the FY19 documents. In the FY18 five-year plan, the AOA was going to wrap up in the fourth quarter of 2018, but will now finish at the end of the first quarter of 2019. The reason for a lengthier AOA is not specified in the budget documents. The FY19 documents indicate the Army is shooting for a production decision in “the FY 2030 timeframe.” The FY18 documents show the service had planned for that phase in FY29. The Army has said for over five years it plans to field a new helicopter in the 2030s as debate has swelled over whether it could procure an aircraft much faster. The companies involved in building two different demonstrator aircraft for the Joint Multi-Role program, which will inform the requirements for an FVL program of record, have advised the Army on possible strategies to move faster, but the ideas to get after that vary. 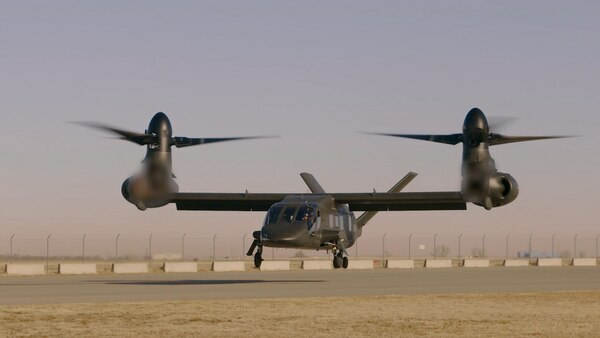 Bell’s demonstrator is the V-280 Valor tiltrotor and a Sikorsky-Boeing team is building the SB-1 Defiant coaxial helicopter. The Army set a goal for the demonstrators to fly in the fall of 2017. While Valor has achieved significant flight hours in the air since first lifting off in December 2017, Defiant has yet to get off the ground and according to high-ranking Army officials, won’t be flying until the summer timeframe. The delays in the the technology development and maturation portion of the FVL program might be reflective of the delay in the JMR program as the Army will need ample time to fly Defiant as well as Valor before ultimately deciding how it will proceed with an official FVL program-of-record. The Army would not comment on the schedule delays laid out in the budget books or if there are plans somewhere down the road to make up for lost time. In response to such a request for information, a service spokesman stated that FVL is an “evolving topic” and the Army would not address the program before the Association of the U.S. Army’s Global Force Symposium that will take place in Huntsville, Alabama, at the end of March. More major news on the Futures Command is expected to be formally revealed at the show including how the service might address its modernization priorities, Army leadership in charge of the effort have said.